Layered Pleated Draperies - by Exciting Windows! 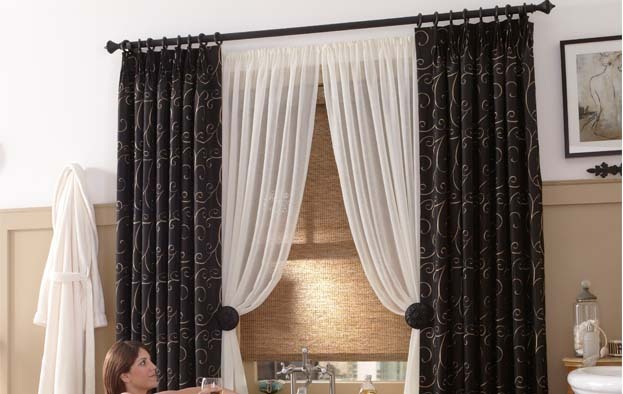 This Window Treatment is a Triple Threat. Custom functioning pleated draperies in contrasting fabric. Custom rod pocket sheers for privacy. Texture roller shade, layered for maximum functionality. Each layer offers our clients the ability to control light, privacy and ambiance in any room of their home. Each fabric is chosen to provide a different texture, and the oil rubbed bronze rods and tie back medallions were chosen to accent the top layer of black fabric. No matter how many layers you prefer, we can help you personalize your window treatments today!